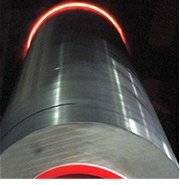 All of Northlake’s steel bar products can be supplied as hydraulic cylinder rods (also known as piston rods) with hard chrome plating and induction hardening. This includes sizes as small as 0.158” (4mm) or as large as 16” and lengths up to 40’ and beyond. Northlake has the capabilities to produce induction hardened bars and tubes in diameters from 0.158” (4mm) through 12”, lengths to 40’ and longer in carbon, alloy, and stainless grades. Therefore we can help with most hydraulic cylinder rod requirements. We offer a full line of C-P-O (Chrome Plated Only) and IH-CP (Induction Hardened and Chrome Plated) products. The items below represent some of our standard stock items. Also, we maintain a large inventory of rough turned raw material in 50K and 75K minimum yield strength. Our steel bar inventory can be quickly processed to your specifications. Hence Northlake is well known for having a vast inventory of long length bars. We carry 294” minimums up to 475” lengths on the floor, depending on size. Watch our video demonstration of an induction hardened bar by clicking here and seeing it in action! 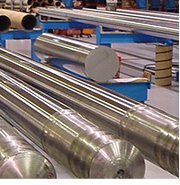 For more information about hydraulic cylinder rods and chrome plated steel bars, please click here to learn more. Below are some of the items we produce and stock on a regular basis. Keep in mind we can produce all of these and other sizes to CPO and IHCP specifications. Northlake can supply chrome plated only and induction hardened and chrome plated products ready for your machining or complete to your hydraulic cylinder rod print. In addition, don’t forget that we can Selectively Harden to your print specifications, leaving areas to be machined soft, saving you time and money! As a result of this, we make your job easier!